Jan DeWeese earned a BA in music theory from Reed in 1972, studying composition with Tomas Svoboda and piano with Fred Rothschild. From 1971-75 he taught ear training at Reed. 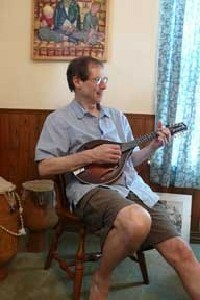 His early mandolin work was a transcription of Bach keyboard suites, Irish traditional music, and the folkloric research of the New Lost City Ramblers (the primary resource for my banjo teaching). Studies in world music have been non-western rhythms with Colin Wolcott, Ghanaian drumming with Obo Addy, Brazilian bandolim with Paulo de Sa, and Cuban tres with Jorge Castro. Recent mandolin performances include Mozart with John Vergin, Brazilian choro with the Oregon Symphony, Cuban son with Roberto Gonzalez, traditional Jewish music with John Hubbard and Jack Falk, and original songs with Kim Stafford. In addition to teaching much of these formal styles, I challenge my students into the structural lineage and grammar of American (and gypsy) musics, as a foundation for improvisational fluency.